Let’s talk about America’s love affair with smoothies. I can’t decide if we have convinced ourselves that drinking a milk shake instead of a meal is A-OK or if smoothies really are a wonder food. Once I finally gave in to the health benefits of protein powder I became fascinated with blending my breakfast. I am certainly not the first person to make a green smoothie, but I do think I have created the perfect blend of vegetables and fruit for a vitamin rich, delicious, and portable meal. Protein powder is a very personal thing. For instance, I cannot eat whey so I went on a quest to find vegan protein with very little sugar. I found perfection from a company called Arbonne who makes a delicious vegan based protein powder in chocolate and vanilla. Heed my advice; don’t start drinking this smoothie if you are not equipped for addiction. This is not low calorie or low fat, but it is packed with vitamins, healthy fats, protein and antioxidants to keep you moving throughout the day. I drink one Mango Kale Smoothie with Coconut and Mint every morning for breakfast (occasionally throwing in some chia seeds for added energy) and I am satiated until late afternoon. I totally get the love affair. Add coconut milk, shredded coconut, kale, and mint into a blender (or vitamix); blend until smooth. Add vanilla protein powder and frozen mango; blend until smooth, scraping down the sides when needed. Pour and enjoy! You made me this for breakfast yesterday and I can attest to the power and great taste of this portable meal on wheels! My daughter can't digest the whey protein either. Thanks for mentioning an alternative. I had no idea Arbonne made protein powder! I used to use their cleanser... going tho check this out! Haha. You need to make a shirt that says that "Welcome to the dark side. We have smoothies." I am absolutely addicted to Arbonne in general, but most importantly the protein powder. It tastes soooo good. This smoothie sounds delicious! I love the addition of the mint, it would be so refresing! Would love one of these right now! The color of this smoothie is absolutely amazing! I love the coconut and mint combo - well done! Love the colour! Sounds amazing too and super healthy, love all the ingredients so can't wait to give it a try. Thank you so much! I was fond of the composition with this one so it's nice that you noticed :) Have a wonderful evening. Hi Kimmi! 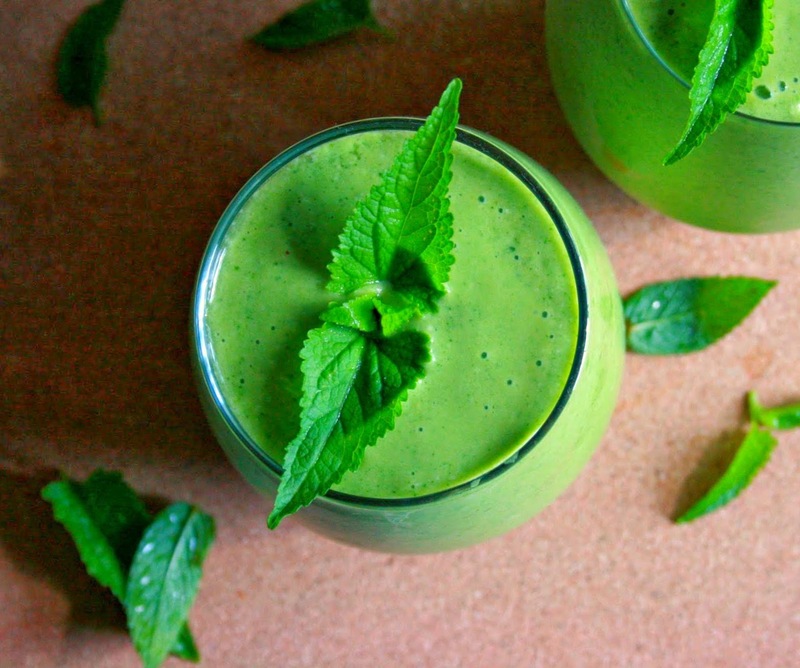 I'm totally impressed by this drink - kale smoothie! How brilliant and delicious this is! WOW! This is a delicious, healthy, and beautiful drink at the same time! What an amazing colour Kimmi! I love kale but would never think to add it to a smoothie. Well, who needs cornflakes when they can blend this beauty in 5 minutes! YOu may not be the first to make a green smoothie, but you may have made the most gorgeous one I've seen--that green is really vivid! I have tried making smoothie with kale before and I would love to try making this smoothie especially your idea of using coconut milk as its base. So glad you found me. I love your blog as well. Looking forward to following! Stunning color of this smoothie and not to mention the wonderful flavor of the coconut - yummy! Have a good week! Thank you! It tastes as bright as it looks! wow ... you drink kale EVERY morning? Now I *really* think you're amazing. You are the amazing one :). I do love blending kale as a way to get just a little bit more in to my daily routine. I think a quick blanched kale will certainly do the trick. You might even have to skip the step of blending it before the frozen fruit is introduced (I do this for a smoother smoothie). Let me know how it goes! I would love to start day with this smoothie, healthy and its also full of flavours, just that never added kale into smoothies before. Healthy and delicious! Now that's just a winner of a combination! Beautifully presented too! The color on this is incredible, I just know from that it must be delicious. Perfect for lunch too, esp with the humidity. This is a great way to change up how kale juice is used - great recipe and post! All I can say is wow what an amazing colour. The mint leaves just make green greener! I love kale too, so works for me! A.
Mint is my favorite herb. I put mint almost in every dish. This smoothie is amazing, the color, my God the color!!! !